Watch the YouTube Video Description/Tutorial! DejaView is an up to date compilation of all my addons put into one neat and tidy package. Bob's simple and neat cast bar replacement. Watch the DejaCharacterStats YouTube Video Description/Tutorial! Only melee (Hunter, melee DPS and tanks) display damage, attack power and attack speed. Only casters have Spell Power and Mp5 displayed. Only Hunters have Focus Regen displayed. Only Death Knights have Rune Speed displayed. Only Rogues, Guardian/Feral Druids and Windwalker/Brewmaster Monks have Energy Regen displayed. Only tanks have Dodge, Parry and Block displayed, and only if appropriate (i.e. no Block is displayed for Vengeance, no Parry is displayed for Guardian). Everything else is hidden unless the character has that stat; i.e. Leech and Avoidance are hidden unless or until you get some of those stats. Allows the chat frame to be moved to the bottom of the screen. Allows shift-scroll to top and bottom of the chat frame. Hides the chat tabs until mouseover. Watch the DejaMark YouTube Video Description/Tutorial! Set the key-binding in the WoW key-bindings menu under "DejaMark". Hold down your chosen key to show the markers at your mouse cursor. Release the key to hide them again. Left click an icon to set a target marker. Left click the same icon again to remove the same marker. Left click the circle-backslash symbol while having a target to remove all target markers. Right click an icon to place a world marker on your mouse cursor then left click in the world to place the world marker. Right click an icon again to remove the world marker from the world and place it on your mouse cursor again. Right click in the world to remove a world flare from your mouse cursor. Right click the circle-backslash symbol to remove all world markers. Adds player coordinates at the top. Adds a nicer visible clock at the bottom. Makes the minimap drag-able and able to save the user's placement. Provides minimap mousewheel zoom scrolling. Hides the clock button, display time on mouseover of the bottom of the minimap, click for the timer. Hides the tracking button, click on the minimap's upper left corner for tracking menu. Hides the world map button, click on the top middle of the minimap to open the world map. Hides the calendar button, click on the top right of the minimap to open the calendar. 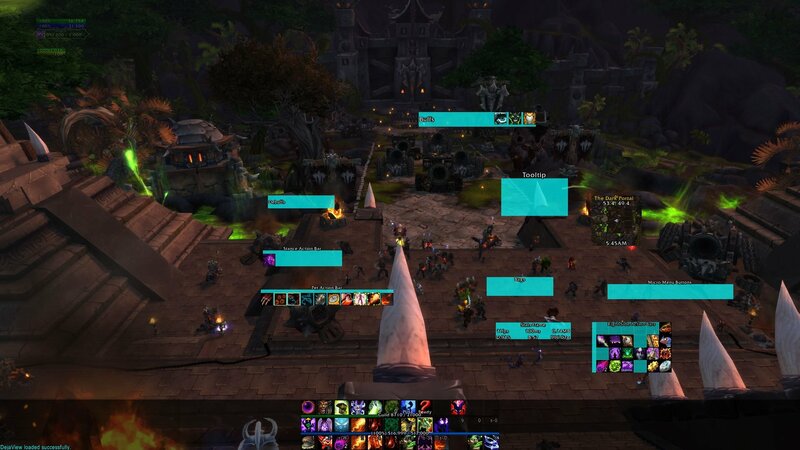 Hides the Garrison/Order Hall menu button, click on the bottom left of the minimap to open the Garrison/Order Hall display. 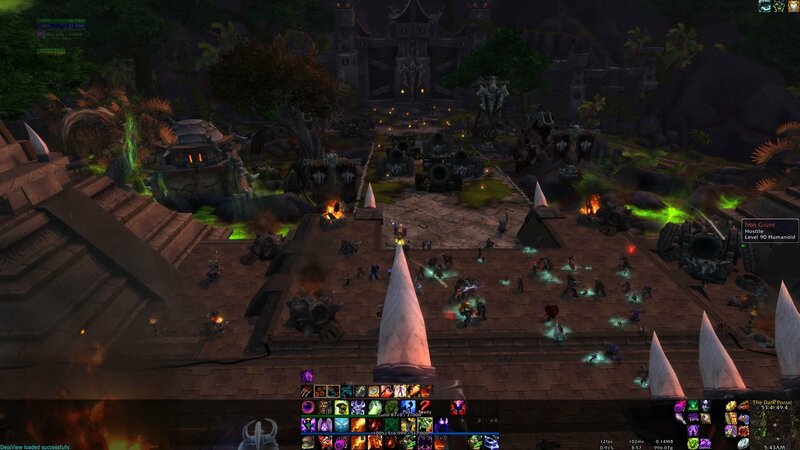 Hides the party and raid manager frame (that bar on the left when you are in a party or raid). 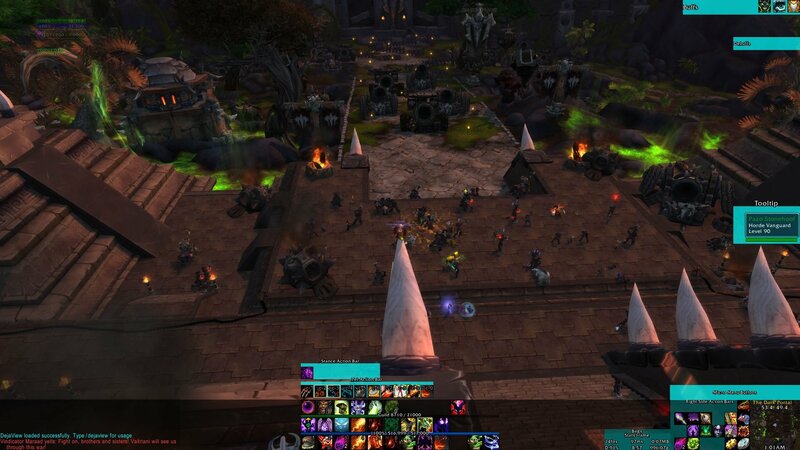 Shows the party and raid frame manager on mouseover. Hide the default raid frames with the built in hide button on the party and raid manager. Moves the target debuff display to the center of the screen horizontally and about 1/3 above the bottom vertically. Moves the target buff frame to just above the debuffs so they do not move all the time. Removes all main action bar and minimap art. Stacks the action bars, stance/shapeshift and pet action bars which are movable with: Hold ALT and Right-click-drag. Hidden Micro Menu buttons appear above the Minimap and are movable. 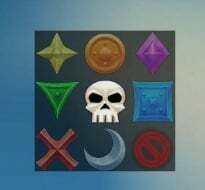 Moves the XP, Reputation, and Artifact bars into the main bar stack. Moves the main game tooltip to the center of the right side of the screen. Automatically sells junk gray items. Automatically repairs armor at a repair vendor. Guild bank repairs are attempted first. Adds simplified commands for reloading the UI, ready check and role check. Scale the UI with the default UI scale in the Game Menu>System>Advanced menu screen. 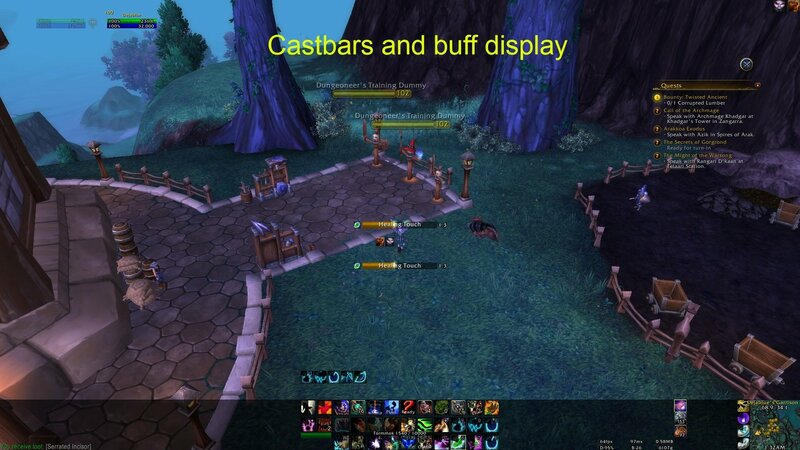 Scale the minimap with the slider in the DejaView addon options panel. Also See "Slash Commands" below. Most elements, except the three stacked main bars, can be moved by unlocking the DejaView frames in the DejaView addons options panel and dragging them to where you wish. The micro menu buttons revert to their default location after a cutscene. Raid unit frames may not update characters joining/leaving the party/raid while in combat; reload the UI (/rl) if they don't update after exiting combat. Implement reputation bar visibility with XP and Artifact bars. Fixed an issue with the DCS scrollbar's max value settings. Removed the DejaView addon loaded message. Fixed saved variables to properly save. Integrated DejaCharacterStats separately with it's own database. Added the ability to reset DejaView and DCS separatly. Moved the DCS options panel to be a child panel under the DejaView main options panel, i.e. the + button to expand and collapse additional options. Fixed an error with cast bars. Integrated latest versions of DejaCharacterStats, DejaMinimap and DejaPRFader. Added the ability to move each action bar separately. Moved the Garrison Menu minimap button to the bottom left of the minimap, it is invisible but works like tracking, calendar, etc. Fixed a German localization font display issue. Fixed a rare ReputationWatchbar display issue. Changed DejaView interface options panel font color to teal. Updated integrated DejaCharacterStats with DCS 7.0.3 b4. Fixed the new Minimap texture strata issues. Fixed DejaPRFader to update properly when in combat. Moved several frames default position slightly to allow easy movement. Added a slight delay before the Bag Buttons and Micro Menu Buttons hide so they dont unintentionally hide when mousing between their frames. Fixed the Minimap texture strata issue. Updated DejaMark: Added the ability to remove all target markers and remove individual world flare markers. Changed /dejaview show and hide to unlock and lock respectively. Fixed the Achievement Micro Button not initially hiding, for real, I may mess with it later to implement a more elegant solution, but now it works, so there we go. 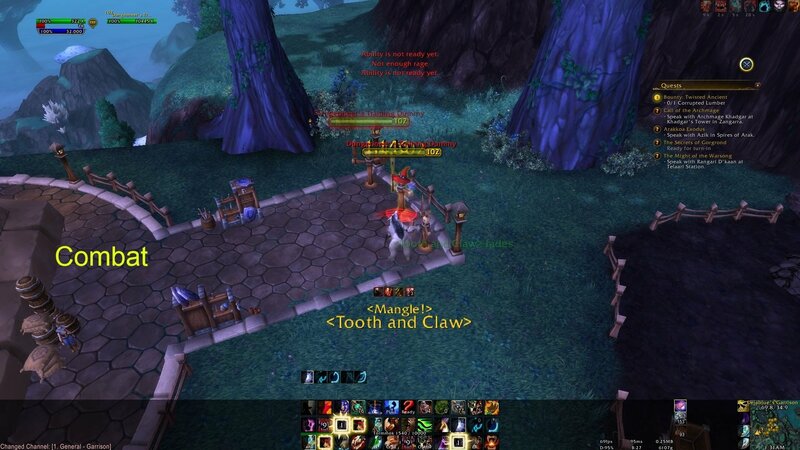 Changed default settings to be consistent with the default UI as intended, most noticeably the player debuff frame. Fixed the blue texture on DejaMark frame from deja blue back to black as intended. Improved the slash command and config interface. The Minimap now locks and unlocks along with all other DejaView frames. Slight tweaks here and there. I will have saved variables implemented soon(tm), I appreciate your patience with my small tweaks that may reset your frame positions. Probably other stuff I forgot about. The micro menu buttons are now place-able. Added a tooltip anchor frame which makes the main game tooltip place-able. All frames that DejaView makes place-able no longer show on mouseover. All frames that DejaView makes place-able are now colored "Deja blue" and lockable. Added an options panel that allows for locking and unlocking the DejaView frames. Added slash commands to allow for locking and unlocking the DejaView frames. Fixed the Achievement Micro Button not initially hiding. 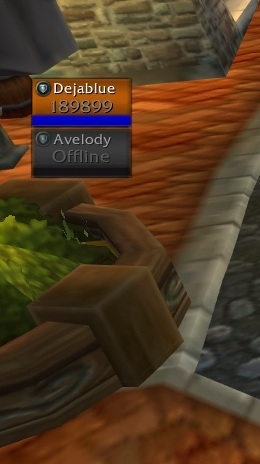 Fixed max level rep bar size issue. Fixed Minimap default clock showing issue. Replaced the right side bars frame with a moveable frame. Fixed taint issues. Player frame alpha issue fixed. Placed Config UI options outside of the toc, to be implemented later. Have you considered trying a viewport on the bottom? I made a ridiculously ightweight addon for this. Yes. I personally used one with DejaUI, did not include it in the release version. The problem is that it changes the aspect ratio and shrinks the screen which iI do not like. It is something I may include. I am planning to have the bottom texture able to be toggled and may also offer a toggle-able view port option as well. On another note, how ya doin BoB? Been a couple years, hehe. Anything new and exciting you working on. Ill have to check out your stuff here when i have time. Last edited by Dejablue : 10-11-14 at 09:32 PM.